1 Cook macaroni, as directed on its package, in at least 2 quarts of salted water (1 teaspoon of salt per quart of water). When cooked through, but still slightly firm (al dente) remove from heat, drain and rinse with cool water until room temperature. 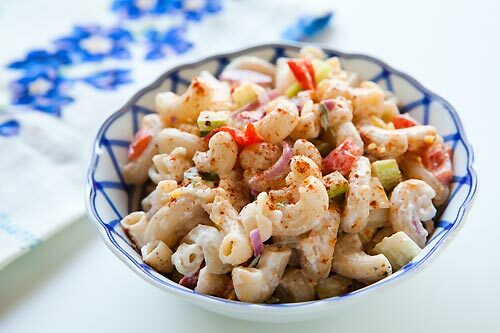 2 While macaroni is cooking, put chopped onions into a small bowl and sprinkle the lemon juice or vinegar over them. This will serve to take the edge off the onions. 2 Combine cooked macaroni, onions, and all other ingredients in a large serving bowl.